Honored to be nominated and voted by Paleo Magazine readers as their favorite farm in 2018! We had an experience we'll never forget when Carhartt and the Pride of Gypsies production team all descended on the ranch for four days to document our daily life and get some special footage for two commercials... one on the history of Carhartt and one honoring hard working mothers everywhere. And I'm as proud as ever to wear my Carhartts on a daily basis - whether I'm feeding cows and helping Brian load and throw 82 bales of hay a day, delivering a new baby animal, collecting chicken eggs, working on the campsite or packing orders in my shop. Thank you Carhartt for letting us be a part of this! October 2018 issue of OPRAH Magazine! As a “Where are you Going? feature of women leading interesting lives. I’d love to introduce you to Mary Heffernan of Five Marys Farms, one of my all time favorite Instagram feeds (@fivemarysfarms) and one of the most brilliant and entrepreneurial farm “brands” I’ve ever seen. If you don’t already follow Five Marys, you absolutely must check out her account. You can also see Mary in the latest issue of Oprah Magazine! Through a beautiful blend of photographs and candid stories, Mary Heffernan shares her family’s farm and ranch life in Northern California’s Siskiyou County. Mary and her family raise 500 cattle, 600 sheep, 180 hogs, plus lots of chickens and sell “pastured everything” including premium pastured beef pork and lamb, honey and other farm products direct to consumers through their online shop, local farm store and new restaurant. Each month I order a box of Five Marys pasture-raised meat which is delivered right to our door and my family has enjoyed hundreds of amazing meals thanks to these passionate ranchers. I asked Mary to share a little bit more about their farm and ranch with Floret readers. If you need a little dose of inspiration, be sure to read on! (And be sure to read through the end so you can also learn about one way you can help families affected by the California fires). Erin: First tell readers a little bit more about yourself. How did you come to ranching in the first place? Mary: We decided to become full-time cattle ranchers four years ago but a year before then, if you’d told me we’d be living on a cattle ranch running a family ranching operation, I wouldn’t have believed it! I was born and raised in in the San Francisco Bay Area and went to college in Virginia, on track to go to medical school. I started tutoring local kids while studying for the MCAT after college and saw a huge need for a place where kids could come to do their homework, so I started my first real brick-and-mortar business called Academic Trainers in my hometown. It made me realize how much I loved small business and I had big ideas for more. It was then, as restaurateurs, that we started our search for the BEST quality beef we could find to serve our customers. After a lot of research, we knew what we wanted: Black Angus cattle with great genetics for marbling and meat quality, raised well, on grasses and barley and dry aged 21-28 days for an outstanding flavor and consistency. When we couldn’t find exactly what we wanted, we decided we would just do it ourselves. 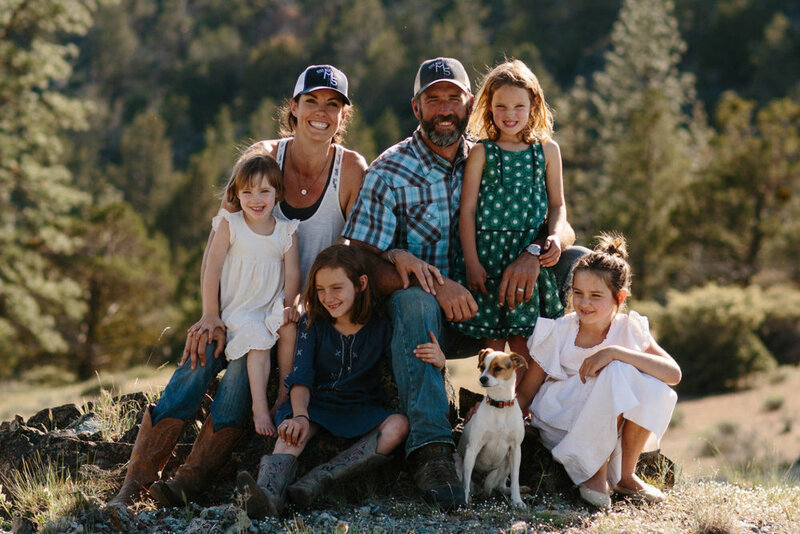 We found this ranch in the mountains of Northern California and with some help from our brother-in-law, a 5th generation cattle rancher, we set up operations and jumped into ranch life while still trying to run our businesses in Silicon Valley. After spending the first eight weekends on the ranch after we bought it working hard with our girls to get things going and getting to know the ranching community, we knew we wanted to do this full time. We sold our Bay Area businesses and sold our house and jumped in. It’s a total change from the life we lived before, but we’ve never felt more satisfied and happy living on our land, raising animals and working together as a family. Erin: Tell us about the ranch and your operation. Our ranch is in a town called Fort Jones (population 681) in the mountains of far northern California, almost to the Oregon border. We have 1800 acres of pasture land and mountain hill country. We raise Black Angus cattle, Navajo Churro sheep and heritage Berkshire hogs for market – meaning that we breed and raise them and ship the beef, pork and lamb to customers all over the country. We knew if we were going to do this full time, without our restaurants to market the meat we raised, that we needed to find a new business model. We tried personally driving meat far distances to customers and we tried traveling to set up Farm Stands (our own version of a Farmers Market) to sell our meat – but we really wanted (and needed) to work on the ranch everyday and not leave. It’s been an ever evolving model but we are finally at a place where we can make this happen, in many ways thanks to the ability to share our story and our products with people all over the country using social media. 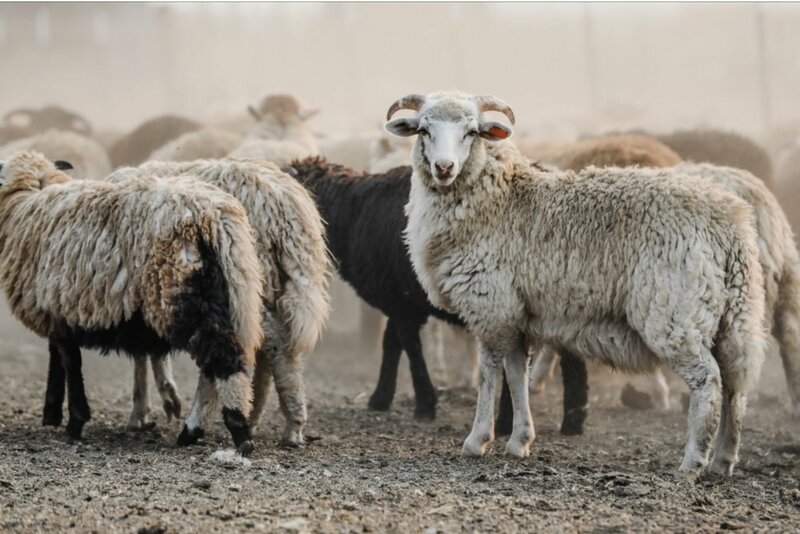 Erin: You ship pasture raised meat all over the country every week from your farm, bypassing the middle man and connecting directly with your customers, fans and followers in a really big way. Can you tell us more about your process and the special transport and box system that you use? Prior to ordering from you, I had no idea that meat could be shipped this way. Mary: We are so happy to be able to share our meats with families and customers all over the country, even Alaska and Hawaii! We are proud to be producing a super quality, premium product and the satisfaction of hearing from so many customers that it is the “best meat they’ve ever tasted” is pretty awesome. We’d spent a full year researching and searching for the best way to ship meat. We wanted to use reusable materials and not bulky foam boxes. We wanted customers to be able to order any cut they wanted – from ground beef to a filet mignon – and not have to commit to a side of beef. We wanted to be able to ship all over the country. After lots of trial and error we have a great system for getting meat to our customers. We use boxes that we brand ourselves with our actual cattle brand (at first to avoid having to pay for custom printed boxes, but it’s kind of become our signature now!) with biodegradable custom insulated liners. We include a block of dry ice in every box to keep the meet frozen until it arrives at our customers’ doorsteps. We use a few different shipping services depending on where the box is going to get it there as quickly as possible and most arrive overnight. Two years ago, when our shipping really ramped up, we opened a Farm Store in town where we have lots of space and a great set up to sell and ship our products (previously we had been shipping from the ranch) and have a nice little retail area for locals and walk-ins to shop too. Erin: How did the ranch get it’s name? Mary: I am a Mary, named after my great grandmother Mary Regan. I come from a long line of strong women named Mary and we honored them in naming our daughters, MaryFrances, MaryMarjorie, MaryJane and MaryTeresa. We honestly didn’t think we’d have all girls or ever planned on all Marys – but once we named Francie and Maisie (they all go by nicknames) – we had to keep it going! My husband came up with the name “Five Marys” when we bought the ranch and decided to market our own ranch raised meats and products. We get a lot of funny comments about naming all of our girls Mary :) but I think my girls love feeling like they are a part of something bigger and sure helps people remember us! Erin: One of the most inspiring things is watching your four girls help on the ranch. You wrote a great e-book about what you’ve learned about raising kids in the country. Can you share a little more about the book? Mary: My girls are extremely independent, resourceful and helpful on the ranch – but I can’t take credit for it. Moving to the ranch and jumping in to raise multiple species of animals and growing our own hay and running a family business – forced us to rely on them to help. We went from a pretty cushy life in the suburbs and taking care of their needs for them (like filling sippy cups and helping them get dressed!) to needing them to step up and help us feed cows off the back of a feed truck or make their own dinner while Brian and I were delivering a newborn calf in distress. They were young when we moved here – all 6 years old and under but I realized by necessity they were so much more capable than I had given them credit for. They were totally capable of doing the laundry and helping each other get up and get dressed for school. They could take care of a sick newborn lamb and drive a 4-wheeler to feed the horses. I learned so much by watching them blossom and grow in this newfound independence, with satisfaction and drive to do more in them as a result. I was so inspired by the changes in our family that I wrote an ebook called “They Can Do It. What I Learned About Raising Kids by Moving to the Country.” It tells our story, how we made the decision to totally switch paths from a busy suburban life in Silicon Valley, the land of opportunity and amenities, to become cattle ranchers in a rural small town and recreate our livelihood. We moved from a big, beautiful home we’d worked so hard for – to a 780 square foot ranch cabin where my girls all shared a bed for the first year and a woodstove is our only source of heat. It was an adjustment – but it honestly feels like we are exactly where we are supposed to be and I’ve never been happier living in a tiny house and working hard on our land everyday with my husband and my girls. Erin: In addition to all of your pasture raised everything, you’ve expanded to include retreats on the ranch and a new restaurant. I’d love to be able to have a Floret planning retreat there some day! Can you share with readers a little more about these new endeavors? Mary: It’s important to us to share what we do and tell our story. There is so much beauty on our ranch and we love entertaining guests to share it – but our little house isn’t the easiest to host! We built a place on our ranch to bring guests to get a taste of ranch life for a few nights – with tent cabins and outdoor showers (with great water pressure and tons of hot water – we all prefer to go up there to shower!) and an awesome outdoor kitchen. We invite guests every summer for “Cooking & Cocktails” retreats to spend three days and two nights on the ranch – waking up to do morning chores with us on the four-wheelers, camp breakfast and coffee over the wood fired stove, cooking lessons, cocktail making and so much more! Then last year (after swearing we’d never go back to restaurant ownership!) we bought the historic bar and restaurant in town and re-vamped it to open Five Marys Burgerhouse, serving all of our own meats to our local community as well as guests from near and far who come to visit. Restaurants are so much work, but we love the community aspect of doing it in a small town. We have local live music every Friday night and it’s like opening up our living room to a small town – everybody shows up and they are so appreciative for good food and a great atmosphere, it’s a lot of fun for us! It’s also been a great landing spot for a lot of visitors from all over the country (and the world!) who come to visit Five Marys. This is always so humbling for us to meet people who travel distances to come here! We just opened a Guesthouse in town too for a cozy place for visitors to stay – it’s a 1850’s craftsman home right down the street from the Burgerhouse with beautiful gardens and fruit trees and a little berry patch. It’s a great spot to host guests, especially in the winter when it’s a little too cold at Camp! Erin: We have a lot of budding and established farmers and small business owners that read the Floret blog and so many of them struggle with the “selling” part of business. We often talk about being the face of your business and instead of “selling” to focus on connecting with your customers by telling your story. You have done an exceptional job of taking us all along for the ride. Can you share any words of wisdom when it comes to marketing in an authentic way? Mary: I feel very fortunate to be able to market and run a thriving business from a rural town, but thanks to the internet and social media (specifically Instagram) it makes it doable and a lot of fun. I totally agree that telling your story is the most important and valuable way to market your business or your brand. These days there are so many easy avenues to shop and so many products out there. People want more. They want to KNOW their farmer or their rancher or their florist. I think the pendulum is swinging back to the “good old days” when you knew these people and they lived right down the road. You would see your neighbor, the rancher, out there feeding his cows twice a day and helping a momma cow in labor – and on Sunday when he opened his farm stand to sell his products, you’d stop to shop feeling good about knowing where you food came from and knowing it was high quality and well taken care of since you saw him out there working everyday as you drove by. That just isn’t geographically as common now – but thanks to social media, you can KNOW your farmer or rancher or florist by watching them share their days and feeling like you know them! It’s pretty cool and a very effective way to share your product and build a successful business. I’ve been mentoring a few other ranchers on getting their product to customers, shipping meats or ranch products and building a business in the agricultural arena – so I’ve been compiling an e-course on everything I’ve learned and ways to market your product, service or brand by telling your story, using social media and building a successful, profitable business. It’s called “YOU CAN DO IT. Small Business from Scratch” and I am super excited to launch this soon! I am so passionate about small business and entrepreneurship – and so thankful I get to do this even living in a rural area. I can’t wait to share this part of my story with others and help them do the same. Erin: Thank you so much, Mary, for taking the time to share your story with Floret readers. I’m super inspired by what you are doing and I’m serious when I say I want to come visit someday soon and have a Floret planning retreat at your ranch! Until then, we’ll all enjoy following your adventures online. Thank you for the interview Erin - you are one of the women in business I admire the most and am so lucky to call you a mentor! California Bountiful Farm Bureau Magazine: "High Five!" - As the sun begins to make its descent in the Siskiyou County sky, Brian Heffernan stacks bales of hay onto the back of his flatbed truck.